A curfew and a ban on daytime traffic were introduced in Baghdad during Friday prayers after the upsurge in violence since the destruction of the Shia shrine at Samarra. Jon Brain, who has spent the past month working in the BBC's Baghdad bureau, says every day is now punctuated by reports of violence from around Iraq. I had never realised peace and quiet could be so unsettling, but waking up in Baghdad the other day was a distinctly surreal experience. The dawn chorus of gunfire, explosions and sirens that normally wafts through the sandbag-reinforced windows of my room was absent. In its place was something I had never heard here before: silence, broken only by birdsong. Far from being a welcome reprieve from this city's usually discordant symphony, this was an ominous silence, a heavily pregnant pause in a country's apparent slide towards civil war. 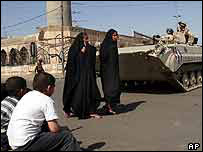 The daytime curfew was the government's response to the wave of violence which has engulfed large parts of Iraq since the bomb attack which destroyed the Shia shrine in the town of Samarra. Violence which has seen mosques burnt to the ground and turned Shia against Sunni. In the past 10 days several hundred people have been killed. Later that morning, as I stood on the main road near our office - normally gridlocked with traffic but now resembling a deserted film set - my thoughts turned to Tobji and Falah Hassan. Tobji is a small mixed Shia and Sunni neighbourhood on Baghdad's north-western outskirts, and Falah Hassan has cast himself in the role of its guardian angel. Before the Samarra bomb, when it was safe to travel, I had gone to see for myself how the residents of Tobji were doing their bit to combat sectarian violence with people of both faiths working together. Falah was a genial, rotund man in his early fifties and I found him at the local council offices barking orders into the walkie-talkie which seemed clamped permanently to his ear. In the gaps between delivering his instructions, he told me how the area had always been peaceful until three months ago. Then the killings had started. First a Sunni, then a Shia, then another Sunni and so on. All shot dead by unknown men who arrived at night by car. But, rather than allow the murders to divide the community, Falah and his neighbours decided to act. They formed a special guard deliberately made up of both Shias and Sunnis and sealed their neighbourhood off from the outside world. ''And now all the killings have stopped,'' Falah told me, breaking into a huge grin. There is not really much to see in Tobji. It sits rather meekly in the shadow of an ugly flyover, a passive recipient of the noise and pollution pumped out from the constant traffic thundering past. Its main feature is its busy high street crammed with shops and outdoor market stalls. Today it was alive with activity. Falah showed me how every single side street had been barricaded off leaving just the main road open. At each end were two checkpoints each manned by a group of earnest looking young men. They were watching intently as each car approached. Another group was patrolling the high street. ''Look, Shia and Sunni working together,'' Falah said proudly. "And have you seen their badges?'' he asked. Each of the guards had a piece of yellow card pinned to his chest. The young men believed they were helping their community stand up to outsiders trying to create divisions between them. ''Terrorists, they want to make a war between us," said Mohammed, a slender man in his early twenties with a rifle slung over his shoulder. But we don't care who's Sunni or who's Shia. We are Iraqis and Muslims." His friend Ali agreed: ''We all live together here. I'm Shia but my sister is married to a Sunni. It's normal." In the marketplace most people spoke positively of the security that Falah's checkpoints and patrols had brought about. But one woman, who was clearly in mourning, was not so sure. 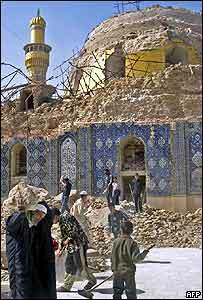 And then, of course, came the bomb attack on the shrine at Samarra. I wanted to know if Tobji's bold initiative had survived the sectarian violence now tearing much of Iraq apart. Because, if they had failed to pull through there, the prospects for the rest of the country were not good at all. My Iraqi translator was told spies had been found operating in Tobji and there had been some sort of trouble. I have not been able to reach Falah to ask him if his guards are still providing a blueprint for harmony or whether the killings have started again. In Baghdad there is still the occasional vehicle curfew but most days the songs of the birds outside my window are drowned out by the noise of a troubled city. From Our Own Correspondent was broadcast on Saturday, 4 March, 2006 at 1130 GMT on BBC Radio 4. Please check the programme schedules for World Service transmission times.